IN AN EXCLUSIVE PARTNERSHIP WITH CASIO, FISHBRAIN HAS ANNOUNCED THAT A WEARABLE VERSION OF THEIR APP IS NOW AVAILABLE ON THE CASIO PRO TREK SMART WSD-F20. 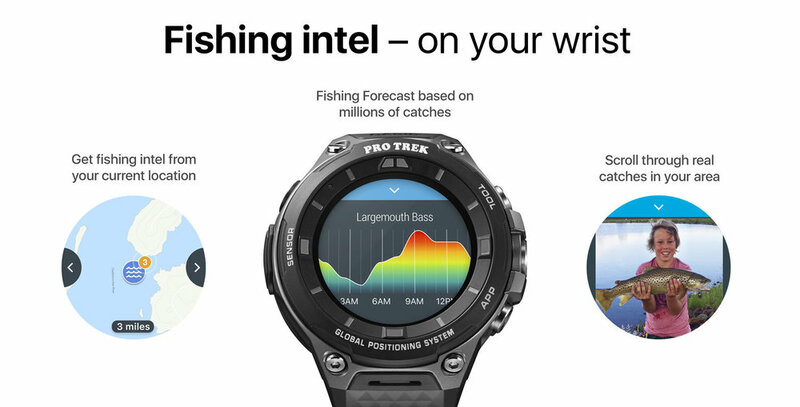 Fishbrain, the world’s most popular fishing app and veritable social network for the angling community with over 4 million users, has announced an exclusive partnership with Casio—one of the world’s foremost watch makers—to provide an integrated system in their new Casio Pro Trek Smart WSD-F20. This system will bring the fishing community’s own shared information on such items as fishing data, interactive maps, and up-to-date location information in the form of a smartwatch.